The Royal Free’s team of infection control nurses have been nominated for a national Nursing Times award after carrying out an investigation into an antibiotic-resistant bacteria. Led by Janice Scott, clinical nurse specialist in infection control, the team carried out a point prevalence survey (PPS) in order to find out how many of our patients might be at risk of carrying or transmitting carbapenemase-producing enterobacteriaceae (CPE). The survey also revealed what the clinical, financial and operational burden on the trust would be if patients were screened for the infection. 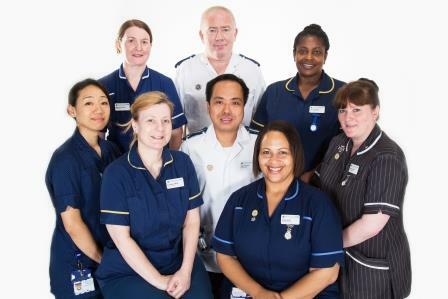 In January 2014 the team, pictured, surveyed 528 in-patients to see if they carried or were at risk of carrying a CPE. The microbiology staff are currently training in rapid testing for the infection. Identifying which patients are carrying a CPE infection is an essential part of an effective screening programme. Janice says the survey allowed the team to identify the group of patients most at risk – such as renal and oncology patients and those in intensive care – and in addition, to determined what the prevalence of the infection might be. The programme was also designed to assess whether testing those at risk is cost effective or whether those identified with CPE alone should be isolated. Yvonne Carter, infection prevention and control service lead nurse, added: “It was a huge task to carry out the survey, which might explain why no PPS has been done before. However, it is so important for us to know the risks this infection poses to our patients. The CPE survey was nominated in the infection prevention and control category. The Royal Free infection control team won the award in 2009 and were finalists in 2011. This year the award ceremony will be on 29 October 2014.